Today I am going to share 150 Disneyland tips that will help you to have a better vacation than the other 18 million visitors who visit the Disneyland Resort each year. With these updated 2019 Disneyland tips you will be ready for everything! Do I have Disneyland tips I usually say?!? How much time do you have? Buy discount Disneyland tickets in advance for a discount. You can save money and avoid a line at the ticket booth when you purchase your tickets in advance. See all my advice on finding discount Disneyland tickets (how to avoid scams and other Disneyland hacks). Stay in a hotel that is close to the parks. You can either stay at a Disney-owned on property hotel or at a partner hotel right next door to the resort. On property hotels give you access to the park an hour early every day of your visit, but are more expensive. The partner hotels are less expensive but have many fewer amenities. 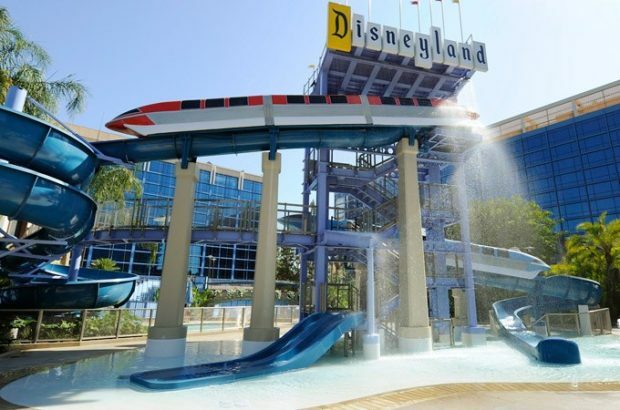 See our recommendations for both types of hotels near Disneyland. Be sure to call your hotel in advance to tell them about your vacation. Recently I was traveling with my grandmother who had never been to Disneyland. I called the Disneyland Hotel to let them know and they greeted us with a First Visit button and a special upgrade to include a fireworks view room and dessert party. All that just by letting them know I was celebrating something. If anyone in your group has an anniversary, birthday, graduation, promotion, or anything else notable that has happened recently, let your hotel know. They are looking for a reason to be nice to you! Purchase Disney gift cards online and get 5% off when you have a Target Red Card. See our full guide on hacking the system and earning at least 5% off everything that you buy at Disneyland. You can purchase discount tickets and then upgrade them to annual passports and save big. When you present a ticket you purchased at a discount to be upgraded to a pass, you actually get the full value of that ticket. See pertaining Disneyland tips in our guide for how to take advantage of this opportunity. Take a photo of the back of your ticket to use in case you lose your Disneyland ticket. Using the barcode from the photo, Guest Relations is able to replace any lost ticket. The Anaheim Convention Center is the biggest on the West Coast. Crowds from the convention center can really change the crowd levels inside both Disneyland and Disney California Adventure. See more Disneyland tips in our when to visit Disneyland guide to avoid these crowds. There are nearly 1 million Annual Passholders at Disneyland. Whether or not they come determines how full the park is. When the lower level Annual Passports are blocked out, the parks will be much less crowded. See our Disneyland crowd calendar. Be sure to wear comfortable clothes and shoes. Visiting Disneyland can be a long day. You will be walking and moving around constantly so make sure you are wearing comfortable clothes and especially shoes. Remember though, you still want to look good for all the pictures. See our full Disneyland packing list and what to wear guide. Be sure to pack a light jacket and dress in layers. While Disneyland is located in warm southern California, expect cold evenings and mornings. Track how far you walk. Use your pedometer or iPhone application to track how far you have walked during your trip. On average my family walks about 9 miles a day at Disneyland. Take a picture when you park your car. The Mickey and Friends parking structure is one of the biggest in the world. Losing your parking spot can be quite easy. Take a photo or drop a pin in your car’s location so that you can remember where you parked after a long day at Disneyland. Arrive at the gate to Disneyland at least 20 minutes before opening. Many days the parks open before their scheduled opening time and you want to be ready to enter when they do. Also, the lines to get in can be long once the actual opening time comes around. You can get an extra hour in Disneyland or Disney California Adventure before the parks open to the public. You can get this extra hour in the park by either staying at a Disney-owned hotel or by purchasing a three day or longer park hopper or non-park hopper discount Disneyland ticket from a Disney ticket reseller. Magic Morning is for guests who purchase three day or longer tickets and takes place in Disneyland Park on select days of the week, right now Tuesdays, Thursdays, and Saturdays. Extra Magic Hour comes when you stay at one of the three Disneyland Resort Hotels and provides alternating access to either Disneyland or Disney California Adventure on every day of the week. If you do not have access to the Extra Magic Hour or Magic Morning, start the day in the park that does not have the extra hour. If Disney California Adventure has Extra Magic Hour and you don’t have access because you aren’t staying on property, start your day in Disneyland. And vice versa. Visiting the park without with early opening will prevent you from running into lines that were formed by the crowds of people who got to enter the theme parks early. You can find this information on the Disneyland entertainment schedule. Get the FREE Disneyland tips, tricks, and discounts newsletter for more information on your trip. Be sure to sign up for the newsletter for exclusive discounts for Disneyland you can’t get anywhere else. Booking a Disneyland vacation package can help you save money. When you book your tickets and hotel together you will save quite a bit more. See all of our information on how to save money with discount Disneyland packages. Use the center gate to enter the parks. There is an individual gate with a turnstile in between the two long rows of turnstiles. Many believe this is just a line for wheelchairs and strollers, but anyone can use this line. Often this line is much shorter. The best Sleeping Beauty Castle photo can be taken from the right hand side of the castle. There are fewer people from this side angle and you are surrounded by greenery rather than concrete. Put your phone on airplane mode when waiting and riding underground rides. On rides that are underground like Indiana Jones, Haunted Mansion, and Pirates of the Caribbean your phone battery will die much more quickly because your phone will be searching for a cellular signal that is not there. Be sure to park hop at Disneyland. This is such a nice attribute of the resort. Everything is so close together that you can really jump around from one corner to another without wasting much time. Do not feel limited in the same way you would at Walt Disney World. I always recommend Park Hopper tickets. Pick up a celebration button. Disneyland makes unique buttons for almost every celebration including birthdays, anniversaries, honeymoons, first visits to the park, and anything else you are celebrating. Wear a button so that Cast Members will say hello and have a reason to make magic for you. That could mean anything from a free dessert to a random front of line pass or just friendly greetings. You never know! 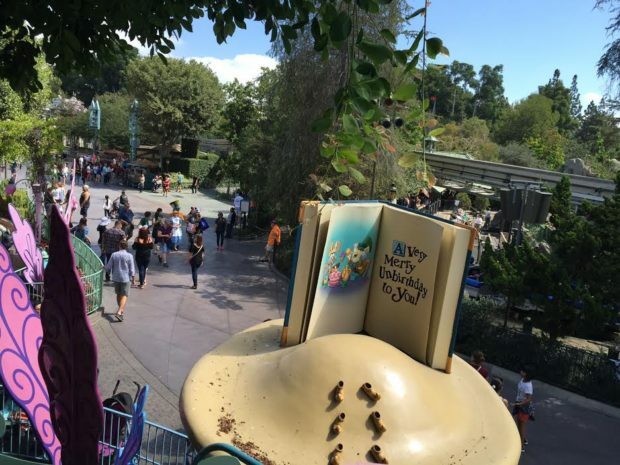 See all of our Disneyland tips about celebrating a birthday at Disneyland. Use Disneyland’s free FastPass service to avoid the lines. The Disneyland FastPass system is essentially a way to reserve a return time for an attraction when you can ride with little to no wait. 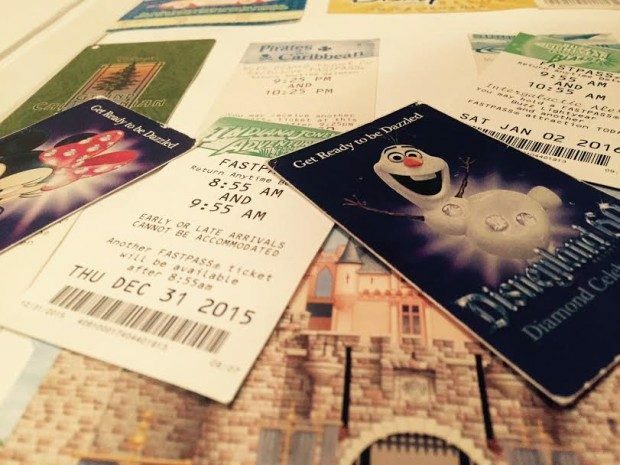 See our full Disney FastPass guide for a full explanation of this very complex system. Updated 4/3/17: No longer works! Sadly this was changed earlier this year. Use the secret FastPass for Buzz Lightyear Astro Blasters. Next door to the FastPass distribution for Star Tours, there are two machines that are not connected to the rest of the FastPass system that distribute FastPass tickets for Buzz Lightyear Astro Blasters. See full explanation of this trick and how disconnected Disney FastPass work here. Updated 10/20/18. Sadly, the FastPass systems are no longer disconnected- Fantasmic! and World of Color are the only ones that remain disconnected.The FastPass systems between Disneyland and Disney California Adventure are disconnected. In addition to the two theme parks being disconnected, some key attractions are not looped into the main system either. Disneyland now enforces FastPass return times (the second time on the ticket). Attempt to return to the attraction before the second time printed on your FastPass ticket. If you are a few minutes late though, do not be too worried. The Cast Members are typically generous. Use the child swap system which allows one adult in the group to wait with a child while the other rides and they can switch. This system allows for both adults in the party to experience the attraction while only waiting once and prevents the child from ever being alone. Bring your own stroller for the kids. When visiting Disneyland, be sure to bring your own stroller rather than renting from the parks. If you do not want to bring your stroller on the trip with you, rent from a company that can deliver to your hotel rather than directly from Disneyland. Call your Disneyland hotel front desk and they should be able to arrange this for you. If you need a wheelchair for someone in your group, do not rent one from the parks. Rent one from the hotel as these can be taken out of the park with you and walked back to the hotel. Establish a very specific meeting point for your group in case you split up. Every time you enter a new area establish a meeting point for your group that you can all return to if you get split up. See our full guide to lost children in Disneyland. Tell children to locate someone with a Disneyland name tag if they are lost. This Disneyland Cast Member who finds your child will make sure that they are accompanied at all times until they are reconnected with you. Write your phone number on your child somewhere in case they are lost. It is easy to get separated in Disneyland when traveling with a group. I recommend Safetytat, a temporary tattoo for your child, as a method to put your phone number directly on your child without any skin damage. If the number is there, you will receive a call from a Cast Member letting you know exactly where you can come meet your lost child. Talk to Cast Members whenever you get the chance. Getting to know the people who work at Disneyland makes the experience that much more dimensional and memorable. By the end of the trip you will end up having a shared experience of some sort with one of them. Ask about where they are from, how long they have been working at Disneyland, why they chose to work in the parks. You will end up hearing some fun stories. Cast Members with solid blue name tags have received a prestigious award. The solid blue name tag honors Cast Members who have received the Walt Disney Legacy Award for embodying the leadership spirit of making magic from Walt Disney. I like to say congratulations when I see these Cast Members who have been recognized by the Disney company. Cast Members are given pins to wear on their name tags honoring them for the amount of years they have worked at the park. Pins range from 1 year all the way up to 50. Keep your eye out for the unique pins worn on the name tag. See our photo guide to all of the pins on the name tags. Pin trade with Cast Members. Another fun activity at Disneyland is the opportunity to pin trade with Cast Members. You will see Cast Members throughout the park with pin lanyards on. You can trade any Disney made pin with any of the pins on the Cast Member lanyards. There are even special Cast Member exclusive pins that you can only find on the Cast Member lanyards. See our Disneyland tips in our guide to Disney pin trading. Purchase your pins for pin trading before going to the parks. Since you are going to be trading your pins away, consider purchasing your trading pins in bulk before arriving at the parks. In the parks, pins cost between $8-$12. When buying in bulk you can find bags of pins for about $1 per pin. See our pin trading guide (linked in #39) for more information. Bring quarters and pennies for pressed pennies. Throughout the park there are pressed penny machines that will imprint special Disneyland designs on them. To press one penny it requires two quarters and one penny. If you think you may want to partake, be sure to have change and some shiny pennies to press. Bring a poncho to the park for water rides. Rather than getting totally soaked, I prefer to bring a poncho when we plan on riding either Splash Mountain or Grizzly River Run. Fly into SNA/John Wayne Airport if you have the option. The Orange County/John Wayne/SNA airport is much closer to Disneyland than any of the other airports. Most of the main carriers still fly into Orange County. See all of our Disneyland tips and information on the Disneyland airports page. Use the Uber app to get around and from the airport to Disneyland. Uber is a fantastic option for transportation that will save you a lot of money throughout your vacation. Use discount code “gavind714ue” to save $20 off your first ride. If you are being dropped off at Disneyland, get dropped off at the Grand Californian Hotel. This is much better than the taxi stand and pick up area on the Harbor Boulevard side of the park. The hotel address is 1600 Disneyland Dr, Anaheim, CA 92802. The Hotels of the Disneyland Resort will store your luggage free of charge at Bell Services. I do recommend you give a tip when you pick up your bag. You can see other Disneyland free things here. If you bring a popped Disneyland balloon to any of the vendors they will give you a new one. Simply return to any balloon vendor with the scraps from your popped balloon. 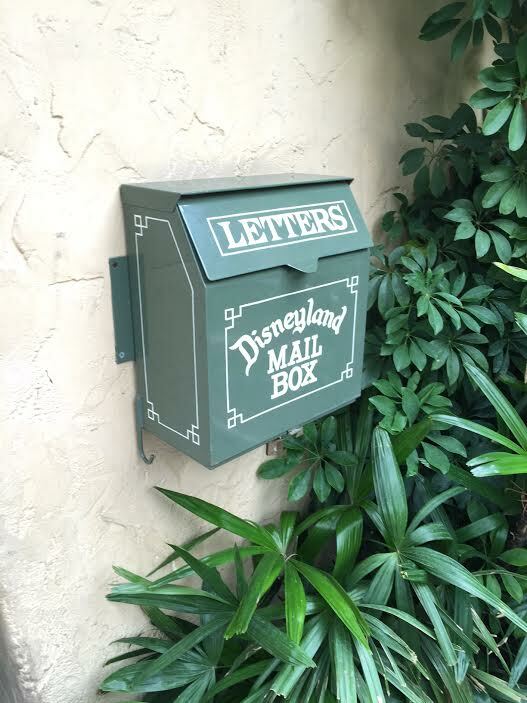 The mailboxes throughout Disneyland are real. Disneyland used to have their own mail cancellation stamp, but now mail sent here is sent out with the Anaheim area stamp. Gluten free items are available at almost every restaurant in the resort. Don’t be afraid to ask at the restaurant. Take full advantage of this Disneyland tip by visiting Guest Relations at either theme park to get an overview of the best restaurants to fit your needs. It can be beneficial for one person in your group to have an annual pass just for the discounts it provides you. Price out your tickets and consider the discount rates that are provided to pass holders. The discounts provided on dining and souvenirs may make purchasing a pass worthwhile. Consider using this Disneyland hack. If someone in your family doesn’t want to go into the park, consider sending them to the spa at Disney’s Grand Californian Hotel and Spa. My mom and aunt made sure I included this tip. They called it a “fantastic” spa located in the Disney California Adventure hotel. Only for those who don’t want to spend everyday in the parks–personally I don’t know why you wouldn’t want to. Buy the souvenir you want when you see it! Every store throughout the Disneyland Resort has a different selection of items available for purchase. You do not want to set your heart on one specific item and then not be able to find that item later. When you see something you want, buy it! Disneyland Purchases can be sent to your hotel room at any on property Disney owned hotel. This is another nice perk of staying at any of the Disneyland hotels. There are specific locations that will hold souvenirs for you so that you can pick them up at the end of the day. These shops are the Disneyland Resort Stroller Shop, Elias & Company in Disney California Adventure Park, Pioneer Mercantile at Disneyland Park, Port Royal at Disneyland Park, and The Star Trader at Disneyland Park. They will just check items that were purchased in the parks and are not limited edition. Disneyland pins make great souvenirs for your vacation. There are pins to represent nearly every experience in Disneyland. Each time we try something new, like the first time we rode California Screamin’ or stayed at the Grand Californian Hotel, we would buy a pin featuring that experience. It’s a great way to remember your Disneyland firsts. Purchase your souvenirs and costumes for kids in advance. If you plan on having your kids wear costumes or use an autograph book, you should definitely purchase these items in advance to save money. You can also find plush toys of Disney characters at much better prices by buying items in advance. See our full Disneyland tips and tricks to finding the best Disneyland souvenirs. Get your silhouette cut on Main Street. Inside a shop on Main Street you can find incredibly talented silhouette cutters who will cut your silhouette on black paper. These cuts are inexpensive and make an extremely memorable souvenir! Don’t miss Trader Sam’s Tiki Bar at the Disneyland Hotel. Located in the middle of the pool area at the Disneyland Hotel, the bar is highly themed bar with fun tropical drinks and special effects throughout. Check out the Disneyland Secrets Facebook page for updates on the latest news, fun historic photos, and more Disneyland hacks. On the page you can find the latest news and fun Disneyland commentary. Be sure to like the page to get a daily post from the parks. Don’t miss the nightly sh-boom moment when the lights come on in Cars Land. Every night at dusk, all the lights come on in Cars Land to the famous sh-boom song. See the video. This nightly light show was suggested by John Lasseter’s son Ben when walking the construction site with his dad near the completion of the project. The show can be seen nightly two minutes after sunset. For a nice view of Cars Land, enter from the Paradise Pier side of the land. This is will provide a breathtaking view of the rockwork and Radiator Springs Racers attraction. The Grizzly River Run lockers are free for the first two hours. Located on the left hand side of the entrance to the attraction, the free lockers are a perfect place to put things you don’t want to get wet during the ride. Be sure to pick up an entertainment schedule when you enter the parks. Do not miss the incredible shows, parades, and entertainment throughout both theme parks. The paper entertainment guide, available at the ticket turnstiles when you walk into the park (or from one of the Cast Members sweeping the street once you are inside the park), is critical. Watch shows later in the day when the parks get more crowded. I highly recommend the Fantasy Faire shows, Mickey and the Magical Map, and the parade. See my other Disneyland tips for what to do when Disneyland is crowded. Never wait more than 15 minutes for fireworks or a parade. For all of these in-park shows, you can still be stand back a few rows and get the entire experience. Watch the parade at the very beginning of the route when it starts next to “it’s a Small World.” Watching from the beginning point means that you will be done viewing the parade while thousands of other people are still waiting to watch. Get in line for “it’s a Small World” right after the parade passes by. This is especially important during the Christmas season when the lines for “it’s a Small World” are extremely long. Please watch the Disneyland Flag Retreat ceremony honoring our country. This daily ceremony happens in the late afternoon in Town Square on Main Street. All of the branches of the armed forces are recognized. Make time to see the presentation! For many this is the best part of a Disneyland visit. Check out our list of the most patriotic things in Disneyland. Watch Great Moments With Mr. Lincoln. I have to mention this item in this list because so many people miss the show completely. The show has great American history and Disney history all wrapped up in one. Mr. Lincoln was the first human Audio-Animatronic Walt Disney Imagineering ever built. Do not promise any specific character to your children. While there are quite a few Disney characters meeting in the parks, they change constantly. You never know who you will see. Ask Guest Relations about specific characters so that they can track them down for you. If there is any specific character you are desperate to meet, you can ask at Guest Relations. They will have the full listing of characters throughout the resort. Character dining can be a great way to meet characters without using a lot of your park time waiting in lines for photos. There are quite a few character dining options. You will want to check out all our Disneyland tips on Disneyland Character Dining here. There is an invisible 50,000 point target on Zurg’s chest on Buzz Lightyear Astro Blasters. This target can be hard to find, but pays off big. See all our Disneyland tips on how to beat your friends on Buzz Lightyear Astro Blasters. Children under the age of three can eat for free in the buffets throughout the resort. Anyone can order kid’s menu items from counter service restaurants. While there are recommended ages for kid’s menu items that are sold from the counter service restaurants in Disneyland, people of any age can order this food. These smaller, simpler, meals can make for a great meal if you aren’t that hungry. All food and snacks are allowed to be brought into Disneyland. While the official policy is that outside food is not allowed in Disneyland, you will not be questioned if you bring food from outside into the theme parks. See my Disneyland packing list guide . Attractions don’t actually shut down when the park closes. Only the lines to attractions close at the listed time the parks close. You can save some of the big attractions for late at night at which point the lines will have gotten shorter and you will be able to be in the park longer. For example, if you get in an 80 minute line for Space Mountain one minute before park close, you could be in the parks an extra 80 minutes after the park officially closes. Shops on Main Street USA and Buena Vista Street are open for 30 minutes to an hour after the official park closing time. This can be a good time to get your shopping done. Look for the secrets of Disneyland while you are touring. 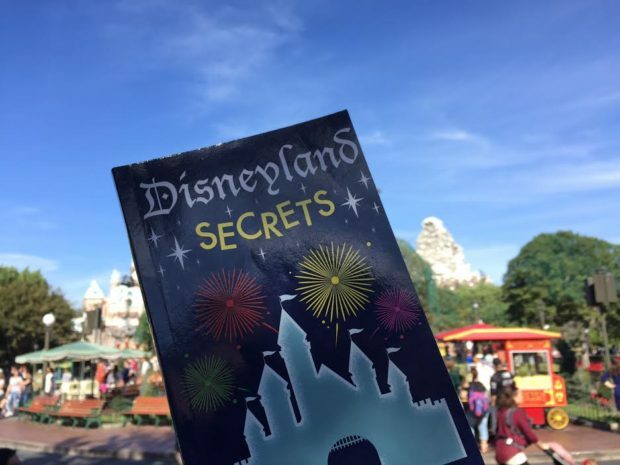 In my best selling book, Disneyland Secrets: A Grand Tour of Disneyland’s Hidden Details, you can find information on secrets and stories from each land of the park. Read the book before your trip and take it into the park to spot hidden details. Not ready to buy the Disneyland secrets book? Read our other article with some Disneyland secrets excerpt from my Disneyland secrets book here. Make dining reservations for your group. Making dining reservations can help provide structure to your day. You can make reservations up to 60 days in advance and can cancel those reservations up until 24 hours before your seating. After the 24 hour mark you will be billed $10 per person of a cancelled reservation. See all of our Disneyland restaurant advice. Make special requests for your dining reservation. If it is your birthday or if you are celebrating something, be sure to let them know. Choose your dining options by looking at your daily schedule. Having a nice sit down dinner can be a great way to break up the day, especially if the park is open late. If the park closes at 9 pm or earlier, make a reservation in Downtown Disney for right when you are leaving the park. Get a FastPass for World of Color and Fantasmic! early in the day. The World of Color nighttime fountain and projection show is incredible. Through Disney’s FastPass system you can grab a free ShowPass to reserve a specific seating area. For World of Color, simply pick up a ticket right when you enter Disney California Adventure. The distribution is located in front of Grizzly River Run. For Fantasmic!, pick up a FastPass from the distribution area next door to the boarding area for the Mark Twain Riverboat and Sailing Ship Columbia. See our full guide to how Disneyland FastPass and disconnected passes work here. My favorite spot to watch the fireworks is halfway between the end of the shops on Main Street and the partners statue. You can secure a spot for the Disneyland fireworks pretty easily all the way up until the show begins. Enter the parks from Monorail or Disney’s Grand Californian Hotel entrance. While you don’t always have to utilize this Disneyland tip, be aware that you can enter Disneyland from the end of Downtown Disney at the Monorail station and enter Disney California Adventure from the Disney’s Grand Californian Hotel and Spa private entrance. Use the Single Rider system to maximize time. This system splits up parties and lets you jump the line so that Disney can fill all the empty seats. 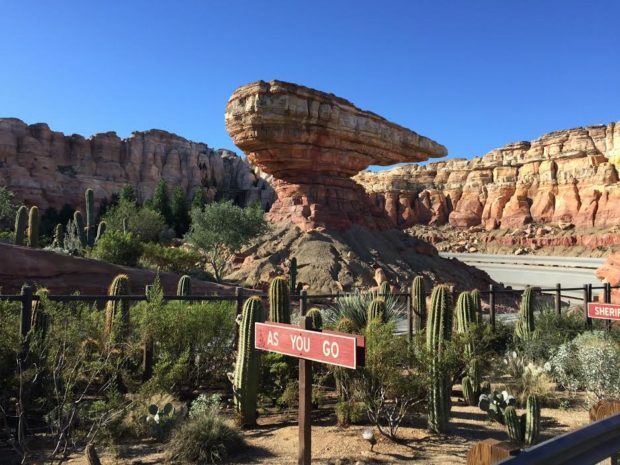 See our Disneyland tips in the Disney Single Rider pass guide. Do not use Single Rider for Soarin’ because this line Single Rider line often takes longer than the real standby queue. Get a FastPass for Soarin’ as they rarely run out. If you are traveling alone, an eReader can make the lines go by quickly. Load up a new book or one of the many books on Disneyland. If you are traveling in a group, download the Heads Up game to play in line while you wait. This is a great game to pass the time in line. The app is like charades but you talk out the answer. The Walt Disney Imagineers have hidden Mickey Mouse heads throughout the theme parks. These are called “Hidden Mickeys” and there are entire books dedicated to helping you find them. See my favorite Disneyland books to bring into the parks. Be on the lookout for Disneyland cats. At last count, there were over 200 cats wandering Disneyland property. These cats are tended to by Disneyland Cast Members and help keep the rodent population under control Sometimes they can be spotted during the day, but mainly they are in the planters. If are at the resort for multiple nights (as we highly recommend), you should ride an outdoor attraction like Big Thunder Mountain or Grizzly River Run while the fireworks are going off. This is a totally unique view of the fireworks and really adds to your experience on the rides. Both Fantasyland and Toontown are closed during the fireworks shows and for both an hour before and after. Do not plan on experiencing anything in these areas during the shows. Find a private restroom in the Enchanted Tiki Room. The Tiki Room is one of the only attractions with its own restroom, because the attraction was originally going to be a restaurant. Interested in a recipe of something you ate in the park or a plant you saw? You can visit Guest Relations and they will be able to get you a recipe for most dishes or identification of most plants. Go to the Grand Californian Hotel lobby to relax. The Hearthstone lounge is a calming place to get a drink and have a snack. They have a limited bar menu. My favorite item is the flat bread. This spot is worth stopping by just for the peaceful atmosphere. Once you are done with your break, enter the parks again from the private hotel entrance. The Carthay Circle Theater Lounge and Restaurant is a fantastic upscale fine dining location. Carthay Circle serves as a perfect oasis of tranquility in the middle of Disney California Adventure park. This restaurant is expensive and real treat! 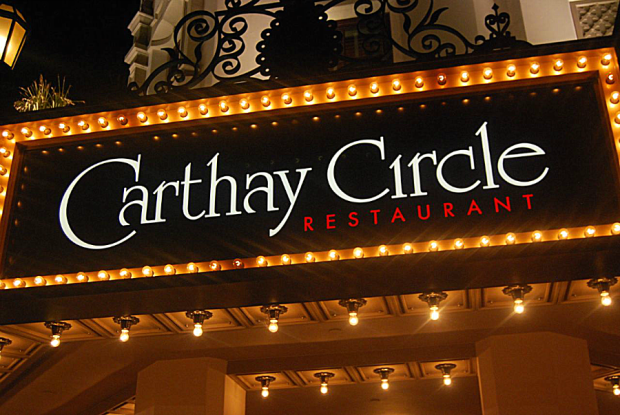 See my review of the Carthay Circle Restaurant. The Animation Building, specifically the Animation Academy is a great break to rest your feet and get inside. You can learn to draw your favorite Disney characters, meet the stars of Frozen, enjoy Turtle Talk With Crush, or take a test to see which Disney character you are. Request the front cabin on the monorail for privacy and fun views of the parks! Plus, this is the only place in the monorail that has air conditioning. There are water bottle filler locations throughout Disneyland. The spigots can be found at Tomorrowland Terrace, Rancho Del Zocalo, the French Market, and the Plaza Inn. Disney California Adventure does not have water bottle fillers. I have found the best place to fill up a bottle is in the Wine Country Trattoria bathroom. Disneyland offers private VIP tours and guided tours. There are a number of tour options ranging from very expensive VIP tour guides where you have free reign of the park to half day tours that center around themes like Christmas at Disneyland. See my Disneyland tips and review on booking a Disneyland VIP tour. Do not fear the rain. Celebrate the forecast of a rainy day. Some of our best days at Disneyland have been on days when it has rained. All of the Southern California locals will be scared away and you will sometimes have the park to yourself. We went on Big Thunder Mountain four times in a row without getting off on one of these days. Download the official Disneyland mobile application. Through the app you can see entertainment times, attraction wait times, character meet and greet locations, park hours, and other ticketing information. Follow official @DisneylandToday on Twitter for live information. If you are on Twitter, you can follow along with posts and ask the account questions about your day. You can always request the ride row you want. You may have to wait a little longer, but they will always give your preference to you. Ride in the front row of Pirates of the Caribbean and Space Mountain. Ride in the back row of Big Thunder Mountain. Choose either the very front row or very back row for Incredicoaster. You have to eat a corn dog!!! I don’t care what your feelings are, you must try one of these deep fried delights. This is a must for every single one of my trips to Disneyland. See Disneyland tips on my three favorite Disneyland snacks. You can purchase corn dogs from multiple places in Disneyland. The Red Wagon Corn Dog cart always seems to have a massive line, so I usually buy mine at the Stage Door Cafe which is attached to the Golden Horseshoe or the Corn Dog Castle in Disney California Adventure. You can order a corn dog a la carte and save $2. The corn dog on the menu includes a side of apples or chips. When you remove the side, you will save $2. Be sure to request this if you don’t want the side, as it is not written anywhere on the menu. Disneyland Counter Service restaurants will always give you free cups of ice water. Specify a large cup otherwise you will get the smallest size they have. Some of the locations will only give you a small cup. There are a number of healthy food options at Disneyland. At almost every sit down restaurant there is a salad option and there are carts throughout both theme parks selling fruit. The best counter service restaurants in Disneyland Park are Rancho Del Zocalo and Jolly Holly Bakery and Cafe. Both of these locations have great food and the lines move quickly. See my favorite Disneyland restaurant options. The best counter service restaurants in Disney California Adventure are in the Pacific Wharf area of the park. I really like the asian rice bowl avaliable at the Lucky Fortune Cookery. The Earl of Sandwich is a great sandwich place in Downtown Disney near the Disneyland hotel. The food is inexpensive and you will be emailed coupons for free sides and sometimes even free sandwiches if you sign up for their email list. The best sit down restaurants at the Disneyland Resort are outside of Disneyland park (in the hotels and Downtown Disney and in Disney California Adventure). These restaurants also have the added bonus of being able to provide a selection of alcoholic beverages. I highly recommend the Carthay Circle Theater, Steakhouse 55, Wine Country Trattoria, Storyteller’s Cafe, and Ralph Brennan’s Jazz Kitchen. See our full Disneyland restaurant review listing. Carthay Circle Theater offers a World of Color dining package that gives you reserved seating for the nighttime fountain show. While the official package is a multi-course meal, your server will likely give you a FastPass even if you order off the menu and tell them you are hoping to see the show later that night. Many people rave about the Blue Bayou Restaurant in Disneyland, but the menu items are quite expensive. For many of the same menu items at a lower price, check out Cafe Orleans. The allure of the Blue Bayou is the fact that it is inside Pirates of the Caribbean, but I have never really enjoyed the dark sleepy atmosphere. If you still want to experience the ambiance of the Blue Bayou restaurant you can make a reservation and just have dessert. Just make reservations for later in the night and attempt to get a table next to the water. Plan on eating food in the parks for every meal except for breakfast. Eat breakfast at your hotel so that you don’t waste valuable time. White Water Snacks and Ralph Brennan’s Jazz Kitchen To Go are both great places to grab breakfast if staying on property. Both of these locations provide reasonably priced breakfast entrees that are fast, filling, and tasty. Ride Fantasyland attractions early in the morning, immediately after the land reopens post fireworks, or right before the park closes. There is no FastPass available for any of the Fantasyland attractions. Ride Peter Pan immediately in the morning. The ride has a 45 minute line that exists nearly the entire day. Sorry no Disneyland hacks to help with this one besides: Get to the park right when Disneyland opens and get in line for Peter Pan. Ride Toy Story Mania first thing in the morning or get a FastPass. Another time to ride is during World of Color as Toy Story Midway Mania is the only attraction on Paradise Pier that stays open during the shows. Typically the line is shorter at this time. Ride Radiator Springs Racers either first thing in the morning or by using the Single Rider line. You should not wait longer than 30 minutes for this attraction if you follow this advice. If the Single Rider line stretches back past the bridge that crosses over the queue, get out of line and come back to this attraction later. Take a break in the afternoon. Go back to the hotel, schedule a late lunch out of the park, or find a long show to rest. Taking advantage of this Disneyland trick will allow you to enjoy your entire vacation. Check Disneyland attraction height restrictions for attractions before your trip to avoid disappointing your children. You will be turned away if they are not tall enough. I have seen kids checked and turned away after they waited in the entire line. The Haunted Mansion is transformed into the Haunted Mansion Holiday from September to January. This overlay is themed to Nightmare Before Christmas. During this period, the Haunted Mansion will have a longer line. 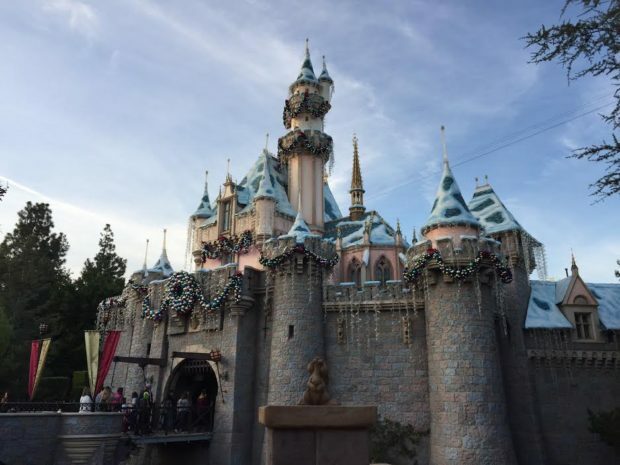 See all our Disneyland tips in our Disneyland Christmas guide. Bring a way to recharge your phone. You could either just bring your charger and look for outlets or bring a portable charger so that you don’t have to stop. If you don’t have a portable charger, you can use one of the outlets near the tables at Rancho del Zocalo. Be sure to bring an extra camera battery into the parks. If you are taking lots of pictures or video, your battery will likely die on your camera. Having an extra really helps. If you are traveling with a baby, check out the baby care centers. There are fully stocked baby care centers in both Disneyland and Disney California Adventure. Check out the park bench in the opera house. Walt Disney sat on this bench in Griffith Park in Los Angeles while watching his daughters on the carousel when he was dreaming of Disneyland. Listen to the area music throughout the park. The soundtracks vary from line to line and land to land. Each set of music is meant to further evoke the theme or feelings from that area. You can hear some of this fantastic music on the great WML95 Youtube channel. The Jungle Cruise gives away free maps. This makes a great souvenir and is one of the best free things in Disneyland. See all of other Disneyland free things. Disneyland dining plan does not work like the Walt Disney World dining plan. The system works through coupons that have to be redeemed for their total value. There is no change given with the system. Get free bread and chocolate from the Pacific Wharf factory tours. A loaf of good sour dough can be purchased for around $5. This is a great filling snack. Disneyland Halloween runs from mid September to October. The parks get more and more busy the closer you are to Halloween. If you want to see Disneyland during Halloween time, go to the parks in September so that you can still see the decorations, but have less crowds. See our full guide to Disneyland Halloween. If you are planning on going to the Disneyland Mickey’s Halloween Party, do not purchase a park ticket for that day. The Halloween party is a private after hours event that happens on nights throughout September and October. The special event ticket also includes access to the park starting at 3pm or 4pm depending on when the Halloween party starts. Thus, there is no reason to double buy park admission if you plan on attending the party. See all my Disneyland tips about Disneyland Mickey’s Halloween Party. Go midweek if you do not like crowds. The crowds in Disneyland pick up in the evenings and on weekends. PhotoPass Cast Members will take photos on your camera. There are PhotoPass Cast Members stationed throughout the theme parks who will take your photo on their camera. You can purchase that professional photo or just have them take another photo on your own camera. Many of the attractions take on-ride photos. These photos are displayed on a screen as you are leaving the attraction. You are welcome to take photo of these photos to avoid having to purchase them. PLEASE turn off the flash on your camera!!! There is nothing worse than having a flash go off on Disneyland attractions. On top of that, these photos will not come out well. Do not attempt to use selfie sticks in Disneyland. They are totally banned from inside the parks. If you do manage to sneak one into the parks and bring it on any ride, that attraction will be shut down. Do not waste your time criss-crossing the park. If you need to get a FastPass, send one “FastPass Runner” to go pick up FastPass tickets for your entire group. Another option is to use the new Disneyland MaxPass service which allows you to make attraction FastPass reservations directly from your phone. Running in Disneyland is not allowed, but I’ve never had someone stop me from skipping through the parks. Truly, let your inner child out. Let Guest Relations know if there is a problem. Disney is nothing if not understanding. They want to make sure you have the best vacation possible. On the other hand, PLEASE write down names of Cast Members who were doing a really fantastic job and leave them compliments at the end of the day. Each trip I leave a list of names and comments with Guest Relations. These comments go into their permanent file and help with promotions. Please do not be demanding. You will have much more success if you tell a Cast Member a problem or ask them for a favor and you are totally understanding that it may not be possible. Remember they are are people too. Consider visiting Universal studios if you have teenagers or a Harry Potter fan in your family. This park is up and coming in Southern California and worth checking out for a day. See all our tips on discount Universal Studios tickets. Side note: The last time I was in the park, it was packed! Be sure to consider the Front of Line ticket. See the guide linked above on how to get the Front of Line ticket for a discount. I hope that these 150 Disneyland hacks, tips, and tricks are helpful in improving your Disneyland vacation. Check out our Disneyland vacation planning guide for more help. Please share this list with anyone who is going on a Disneyland vacation! Do you have Disneyland tips to share? Comment on our Facebook page or below. Visit the official Disneyland website for full information on current park hours and updated offerings. RE: writing your number in sharpie. I ask City Hall or Chamber of Commerce for stickers that say “I am here at Disneyland with….” and fill in my number. I place the sticker on the back of shirts. Some Guest Services Kiosks also have these stickers or similar. They are cute, fun and the kids love them! If we are doing a multi-day trip, I stop on the way out to get new stickers for the next day. Will you be releasing 2018 tips and if so, when? Great post. Two things I have to say. My son is a CM and I go twice a week. There are still Fast Passes for Buzz Lightyear. Right, where you stated. I also think that the rainy day tip is a big misnomer. Most of the pass holders come out when it is raining thinking the same thing. I do think it is great you put emphasis on commenting on good service and being kind. On airports … The long beach airport (LGB) is also very close and often much cheaper than SNA. It is a chill relaxing easy to use airport.